The Consumer Electronics Association, the producers of the Consumer Electronics Show (CES), this year introduced a new area to CES. Over the years CEA has added several category specific areas to the ever-growing show floor. China, Korea and Japan all have their own areas in addition to the ability to spring for a full booth on the main show floor. Eureka Park was housed in the Venetian hotel which was also home to the exhibits in the 70000 area and PMA which is the photography convention that merged with CES this year. Putting Eureka park in the Venetian hotel as opposed to the convention center, allowed CEA to offer start-ups their own place to play and show off their wares, apps and ideas. It also allowed CEA to offer booth space at the largest trade show in the western hemisphere at a lower cost than the premium spaces at the Las Vegas Convention Center. Although traveling back and forth from the Venetian can be cumbersome the Eureka Park area was well worth the day we spent over there. Our Senior Editor Brent Fishman and I spent a day Thursday at Eureka Park. Eureka Park was actually refreshing, most of the Eureka Park participants were newbies to the Consumer Electronics Show and it showed when they talked to us. Big smiling faces, and an eagerness to explain everything about their business were welcomed by Brent and myself. You could feel the passion these start-ups had, it was more than a pitch fest. For me the stand out at Eureka Park was definitely the Modrobotics people and their cubelets. The guys from Modrobotics looked to be right out of college. Their enthusiasm about their robotic construction kits for kids was infectious. Check out the story and video here. While not every parent is going to see the value in a toy over $150 dollars the cubelets definitely look like hours of curious and educational fun, are there even Zany Brainy’s still around for this kind of thing? WipNet was probably the most useful thing we saw at Eureka Park. This technology uses the coaxial cable in your home to rebroadcast your internet signal through ethernet and wi-fi. As the guy explained to us in this video, you get better throughput from the cable versus the copper wire solutions offered by companies like Linksys and Motorola. While Justin Bieber showed up at Topsy’s booth at the Convention Center on Wednesday to promote a robot, a company his girlfriend, Selena Gomez, invested in called Post Cards On The Run, showed off an app that can be useful and fun. With their app you can send actual postcards through the mail by taking a picture from your camera or in your gallery. It’s a great way to send vacation photos,family photos or just fun photos with grandma who may not have access to a smartphone or a computer. We covered a lot of great companies at Eureka Park here on nibletz.com so feel free to peruse the site and see more of what the companies had to offer. On the downside the company we aren’t sure will lost long was Text Rings. 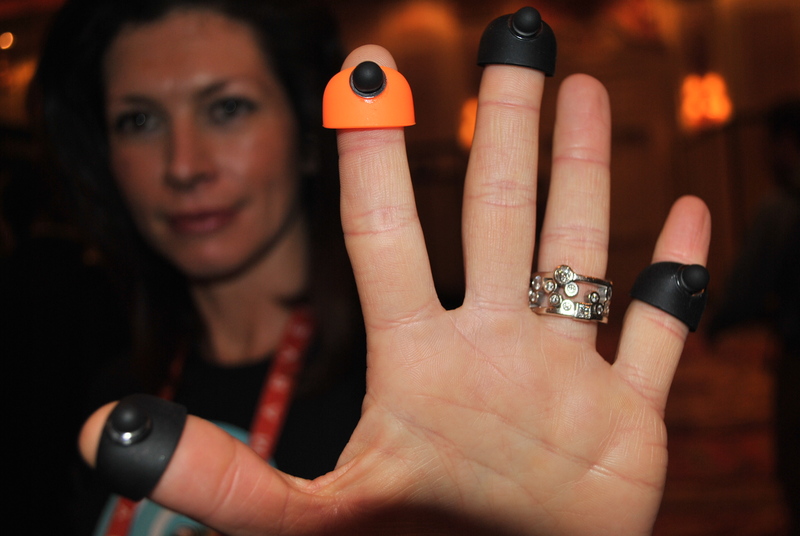 Text Rings offers rings that have stylus’ built into it. To me they reminded me of those spider rings you can get around Halloween. Quite frankly they would have had a chance if the pricing was right but as the founder told us they are priced at $29.99 for two. It’s a decent idea but at $29.99 I can keep my fashion sense and get a few full-sized pen stylus’ even one with a laser pointer. 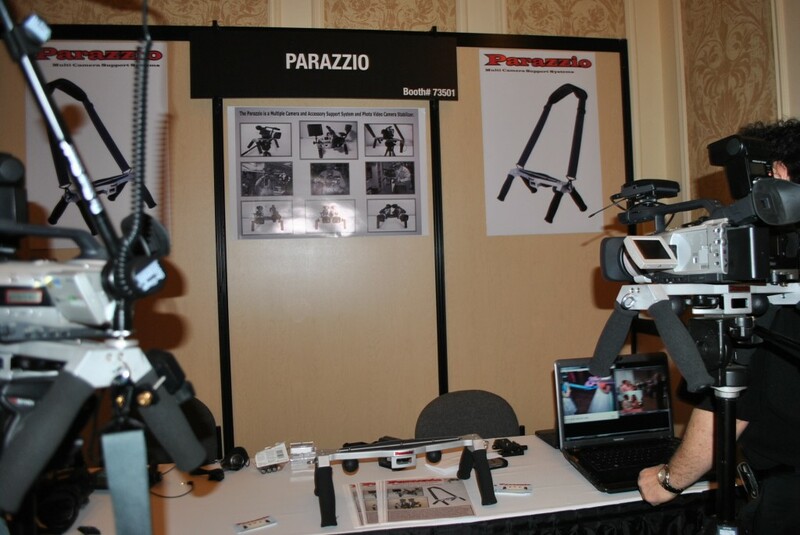 Then there was the company that pissed me off the most, a company called Parazzio. The guy makes paparazzi stands for cameras and video cameras, he hijacked me and my equipment for a demo, I could deal with that, then he tried to do a stand up video with me, my PR firm and lawyer may have something to say about that. I do hope that CEA continues to support start-ups with Eureka Park. It’s a great place for small companies to experience the ginormous CES show.